For other uses, see Stairs (disambiguation). "Stairwell" redirects here. For the 9/11 dramatization, see Stairwell: Trapped in the World Trade Center. "Staircase", "Stairway", and "Stair" redirect here. For other uses, see Staircase (disambiguation), Stairway (disambiguation), and Stair (disambiguation). Stairways in Persepolis, Iran, built ca. 550 B.C. A stairway, staircase, stairwell, flight of stairs, or simply stairs, is a construction designed to bridge a large vertical distance by dividing it into smaller vertical distances, called steps. Stairs may be straight, round, or may consist of two or more straight pieces connected at angles. Special types of stairs include escalators and ladders. 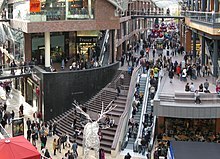 Some alternatives to stairs are elevators (lifts in British English), stairlifts and inclined moving walkways as well as stationary inclined sidewalks (pavements in British English). A stair, or a stairstep, is one step in a flight of stairs. In buildings, stairs is a term applied to a complete flight of steps between two floors. A stair flight is a run of stairs or steps between landings. A staircase or stairway is one or more flights of stairs leading from one floor to another, and includes landings, newel posts, handrails, balustrades and additional parts. A stairwell is a compartment extending vertically through a building in which stairs are placed. 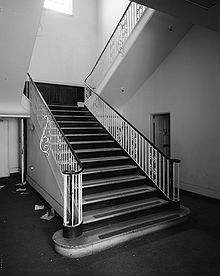 A stair hall is the stairs, landings, hallways, or other portions of the public hall through which it is necessary to pass when going from the entrance floor to the other floors of a building. Box stairs are stairs built between walls, usually with no support except the wall strings. Stairs may be in a straight run, leading from one floor to another without a turn or change in direction. Stairs may change direction, commonly by two straight flights connected at a 90 degree angle landing. Stairs may also return onto themselves with 180 degree angle landings at each end of straight flights forming a vertical stairway commonly used in multistory and highrise buildings. Many variations of geometrical stairs may be formed of circular, elliptical and irregular constructions. Stairs may be a required component of egress from structures and buildings. Stairs are also provided for convenience to access floors, roofs, levels and walking surfaces not accessible by other means. Stairs may also be a fanciful physical construct such as the stairs that go nowhere located at the Winchester Mystery House. Stairs are also a subject used in art to represent real or imaginary places built around impossible objects using geometric distortion, as in the work of artist M. C. Escher. 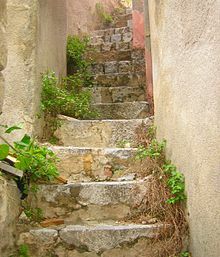 "Stairway" is also a common metaphor for achievement or loss of a position in the society; or as a metaphor of hierarchy (e.g. Jacob's Ladder, The Battleship Potemkin). Each step is composed of tread and riser. The part of the stairway that is stepped on. It is constructed to the same specifications (thickness) as any other flooring. The tread "depth" is measured from the outer edge of the step to the vertical "riser" between steps. The "width" is measured from one side to the other. The vertical portion between each tread on the stair. This may be missing for an "open" stair effect. An edge part of the tread that protrudes over the riser beneath. If it is present, this means that, measured horizontally, the total "run" length of the stairs is not simply the sum of the tread lengths, as the treads overlap each other. Many building codes require stair nosings for commercial, industrial, or municipal stairs as they provide anti-slip properties and increase pedestrians safety. Where stairs are open on one or both sides, the first step above the lower floor or landing may be wider than the other steps and rounded. 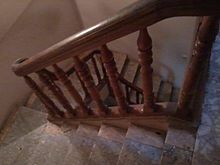 The balusters typically form a semicircle around the circumference of the rounded portion and the handrail has a horizontal spiral called a "volute" that supports the top of the balusters. Besides the cosmetic appeal, starting steps allow the balusters to form a wider, more stable base for the end of the handrail. Handrails that simply end at a post at the foot of the stairs can be less sturdy, even with a thick post. A double bullnose can be used when both sides of the stairs are open. The structural member that supports the treads and risers in standard staircases. There are typically three stringers, one on either side and one in the center, with more added as necessary for wider spans. Side stringers are sometimes dadoed to receive risers and treads for increased support. Stringers on open-sided stairs are called "cut stringers". Winders are steps that are narrower on one side than the other. They are used to change the direction of the stairs without landings. A series of winders form a circular or spiral stairway. When three steps are used to turn a 90° corner, the middle step is called a kite winder as a kite-shaped quadrilateral. Various moldings are used to decorate and in some instances support stairway elements. Scotia or quarter-round are typically placed beneath the nosing to support its overhang. A decorative step at the bottom of the staircase which usually houses the volute and volute newel turning for a continuous handrail. The balustrade is the system of railings and balusters that prevents people from falling over the edge. The angled member for handholding, as distinguished from the vertical balusters which hold it up for stairs that are open on one side; there is often a railing on both sides, sometimes only on one side or not at all, on wide staircases there is sometimes also one in the middle, or even more. The term "banister" is sometimes used to mean just the handrail, or sometimes the handrail and the balusters or sometimes just the balusters. A handrail end element for the bullnose step that curves inward like a spiral. A volute is said to be right or left-handed depending on which side of the stairs the handrail is as one faces up the stairs. Instead of a complete spiral volute, a turnout is a quarter-turn rounded end to the handrail. The vertical handrail that joins a sloped handrail to a higher handrail on the balcony or landing is a gooseneck. Where the handrail ends in the wall and a half-newel is not used, it may be trimmed by a rosette. Wall handrails are mounted directly onto the wall with wall brackets. At the bottom of the stairs such railings flare to a horizontal railing and this horizontal portion is called a "starting easing". At the top of the stairs, the horizontal portion of the railing is called a "over easing". Wood handrails often have a metal core to provide extra strength and stiffness, especially when the rail has to curve against the grain of the wood. The archaic term for the metal core is "core rail". A term for the vertical posts that hold up the handrail. Sometimes simply called guards or spindles. Treads often require two balusters. The second baluster is closer to the riser and is taller than the first. The extra height in the second baluster is typically in the middle between decorative elements on the baluster. That way the bottom decorative elements are aligned with the tread and the top elements are aligned with the railing angle. A large baluster or post used to anchor the handrail. Since it is a structural element, it extends below the floor and subfloor to the bottom of the floor joists and is bolted right to the floor joist. A half-newel may be used where a railing ends in the wall. Visually, it looks like half the newel is embedded in the wall. For open landings, a newel may extend below the landing for a decorative newel drop. A decorative cap to the top of a newel post, particularly at the end of the balustrade. For systems where the baluster does not start at the treads, they go to a baserail. This allows for identical balusters, avoiding the second baluster problem. A decorative filler piece on the floor between balusters on a balcony railing. Handrails may be continuous (sometimes called over-the-post) or post-to-post (or more accurately newel-to-newel). For continuous handrails on long balconies, there may be multiple newels and tandem caps to cover the newels. At corners, there are quarter-turn caps. For post-to-post systems, the newels project above the handrails. Another, more classical, form of handrailing which is still in use is the tangent method. A variant of the Cylindric method of layout, it allows for continuous climbing and twisting rails and easings. It was defined from principles set down by architect Peter Nicholson in the 18th century. 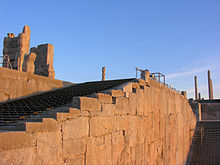 The earliest spiral staircases appear in Temple A in the Greek colony Selinunte, Sicily, to both sides of the cella. The temple was constructed around 480–470 BC. Staircase in Ford plant in Los Angeles with double bullnose and two volutes. An intermediate landing is part of this U-shaped stair. This is a wooden fascia board used to cover up trimmers and joists exposed by stairwell openings. The apron may be moulded or plain, and is intended to give the staircase a cleaner look by cloaking the side view. For stairs with an open concept upper floor or landing, the upper floor is functionally a balcony. For a straight flight of stairs, the balcony may be long enough to require multiple newels to support the length of railing. In modern homes, it is common to have hardwood floors on the first floor and carpet on the second. The homeowner should consider using hardwood nosing in place of carpet. Should the carpet be subsequently replaced with hardwood, the balcony balustrade may have to be removed to add the nosing. A flight is an uninterrupted series of steps. A flight of stairs is said to be "floating" if there is nothing underneath. The risers are typically missing as well to emphasize the open effect, and create a functional feature suspended in midair. There may be only one stringer or the stringers otherwise minimized. Where building codes allow, there may not even be handrails. A landing is the area of a floor near the top or bottom step of a stair. An intermediate landing is a small platform that is built as part of the stair between main floor levels and is typically used to allow stairs to change directions, or to allow the user a rest. A half landing is where a 180° change in direction is made, and a quarter landing is where a 90° change in direction is made (on an intermediate landing). As intermediate landings consume floor space they can be expensive to build. However, changing the direction of the stairs allows stairs to fit where they would not otherwise, or provides privacy to the upper level as visitors downstairs cannot simply look up the stairs to the upper level due to the change in direction. The word 'landing' is also commonly used for a general corridor in any of the floors above the ground floor of a building, even if that corridor is located well away from a staircase. Carpeting that runs down the middle of the stairs. Runners may be directly stapled or nailed to the stairs, or may be secured by a specialized bar that holds the carpet in place where the tread meets the riser, known as a stair rod. If there is not another flight of stairs immediately underneath, the triangular space underneath the stairs is called a "spandrel". It is frequently used as a closet. This term is often reserved for the stairs themselves: the steps, railings and landings; though often it is used interchangeably with "stairs" and "stairway". In the UK, however, the term "staircase" denotes what in the U.S. is called "stairway", but usually includes the casing – the walls, bannisters and underside of the stairs or roof above. This primarily American term is often reserved for the entire stairwell and staircase in combination; though often it is used interchangeably with "stairs" and "staircase". 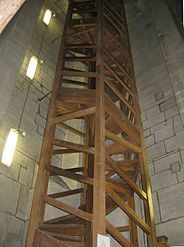 The spatial opening, usually a vertical shaft, containing an indoor stairway; by extension it is often used as including the stairs it contains. A tower attached to, or incorporated into, a building that contains stairs linking the various floors. The measurements of a stair, in particular the rise height and going of the steps, should remain the same along the stairs. The rise height or rise of each step is measured from the top of one tread to the next. It is not the physical height of the riser; the latter excludes the thickness of the tread. A person using the stairs would move this distance vertically for each step taken. 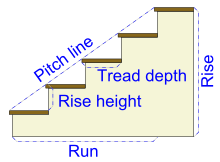 The tread depth of a step is measured from the edge of the nosing to the vertical riser; if the steps have no nosing, it is the same as the going; otherwise it is the going plus the extent of one nosing. The going of a step is measured from the edge of the nosing to the edge of nosing in plan view. A person using the stairs would move this distance forward with each step they take. To avoid confusion, the number of steps in a set of stairs is always the number of risers, not the number of treads. The total run or total going of the stairs is the horizontal distance from the first riser to the last riser. It is often not simply the sum of the individual tread lengths due to the nosing overlapping between treads. If there are N steps, the total run equals N-1 times the going: the tread of the last step is part of a landing and is not counted. The total rise of the stairs is the height between floors (or landings) that the flight of stairs is spanning. If there are N steps, the total rise equals N times the rise of each step. 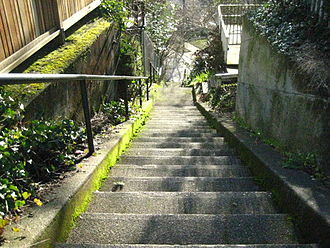 The slope or pitch of the stairs is the ratio between the rise and the going (not the tread depth, due to the nosing). It is sometimes called the rake of the stairs. The pitch line is the imaginary line along the tip of the nosing of the treads. 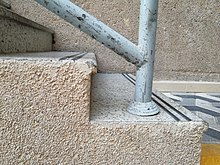 In the UK, stair pitch is the angle the pitch line makes with the horizontal, measured in degrees. The value of the slope, as a ratio, is then the tangent of the pitch angle. Headroom is the height above the nosing of a tread to the ceiling above it. Walkline – for curved stairs, the inner radius of the curve may result in very narrow treads. The "walkline" is the imaginary line some distance away from the inner edge on which people are expected to walk. Building code will specify the distance. Building codes will then specify the minimum tread size at the walkline. Stairs can take a large number of forms, combining winders and landings. the upstairs is directly visible from the bottom of a straight flight of stairs. it is potentially more dangerous in that a fall is not interrupted until the bottom of the stairs. a straight flight requires enough space for the entire run of the stairs. Another form of straight staircase is the space saver staircase, also known as paddle stairs or alternating tread staircases, that can be used for a steeper rise, but these can only be used in certain circumstances and must comply with regulations. However, a basic straight flight of stairs is easier to design and construct than one with landings or winders. Although the rhythm of stepping is not interrupted in a straight run, which may offset the increased fall risk by helping to prevent a misstep in the first place, many stairs will require landings or winders to comply with safety standards in the Building Regulations. The upstairs is not directly visible from the bottom of the stairs, which can provide more privacy for the upper floor. A fall can be halted at the landing point, reducing the distance someone would fall to reduce risks. Though the landings consume total floor space, there is no requirement for a large single dimension, allowing more flexible floorplan designs. For larger stairs, particularly in exterior applications, a landing can provide a place to rest the legs. Other forms include stairs with winders that curve or bend at an acute angle, three flight stairs that join at a landing to form a T-shape, and stairs with balconies and complex designs can be produced to suit individual properties. A mono string staircase is a term used for a steel spine staircase with treads. A Double string staircase has two steel beams on either side and treads in the center. Spiral stairs in Art Deco style. Nebotičnik skyscraper, Ljubljana. Double spiral staircase of the Ministers' Building (The Secretariat ) in Yangon. "Spiral staircase" redirects here. For other uses, see Spiral staircase (disambiguation). "Circular staircase" redirects here. For the novel, see The Circular Staircase. 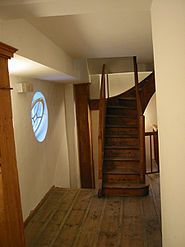 Spiral stairs, sometimes referred to in architectural descriptions as vice, wind around a newel (also the central pole). In Scottish architecture, they are commonly known as a turnpike stair. They typically have a handrail on the outer side only, and on the inner side just the central pole. A squared spiral stair assumes a square stairwell and expands the steps and railing to a square, resulting in unequal steps (larger where they extend into a corner of the square). A pure spiral assumes a circular stairwell and the steps and handrail are equal and positioned screw-symmetrically. A tight spiral stair with a central pole is very space efficient in the use of floor area. The wider the spiral, the more steps can be accommodated per spiral. Therefore, if the spiral is large in diameter, via having a central support column that is strong (invariably large in diameter) and a special handrail that helps distributes the load, each step may be longer and therefore the rise between each step may be smaller (equal to that of regular steps). Otherwise, the circumference of the circle at the walk line will be so small that it will be impossible to maintain a normal tread depth and a normal rise height without compromising headroom before reaching the upper floor. To maintain headroom some spiral stairs have very high rises to support a very short diameter. These are typically cases where the stairwell must be a small diameter by design or must not have any center support by design or may not have any perimeter support. 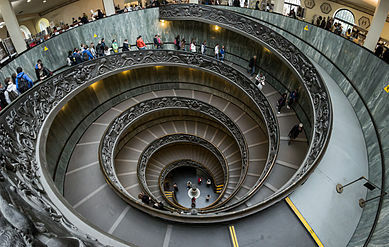 An example of perimeter support is the Vatican stairwell shown in the next section or the gothic stairwell shown to the left. That stairwell is only tight because of its design in which the diameter must be small. Many spirals, however, have sufficient width for normal size treads (8 inches) by being supported by any combination of a center pole, perimeter supports attaching to or beneath the treads, and a helical handrail. In this manner, the treads may be wide enough to accommodate low rises. The photo on the right are self-supporting stairs. This means the spiral needs to be necessarily steep to allow the weight to distribute safely down the spiral in the most vertical manner possible. Spiral steps with center columns or perimeter support do not have this limitation. Building codes may limit the use of spiral stairs to small areas or secondary usage if their treads are not sufficiently wide or have risers above 9 and a half inches. 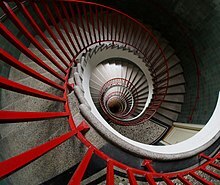 The term "spiral" has a more narrow definition in a mathematical context, as a mathematical spiral lies in a single plane and moves towards or away from a central point. The mathematical term for motion where the locus remains at a fixed distance from a fixed line whilst moving in a circular motion about it is "helical". The presence or otherwise of a central pole does not affect the terminology applied to the design of the structure. 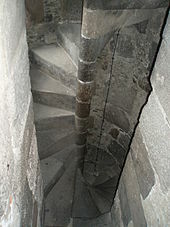 Spiral stairs in medieval times were generally made of stone and typically wound in a clockwise direction (from the ascender's point of view), to place attacking swordsmen (who were most often right-handed) at a disadvantage. This asymmetry forces the right-handed swordsman to engage the central pike and degrade his mobility compared with the defender who is facing down the stairs. Extant 14th to 17th-century examples of these stairways can be seen at Muchalls Castle, Crathes Castle and Myres Castle in Scotland. Exceptions to the rule exist, however, such as Ferniehirst Castle where the Clan Kerr defenders tended to be left-handed. 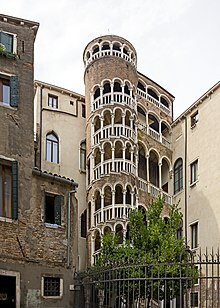 This may be seen in the accompanying image of the Scala of the Palazzo Contarini del Bovolo, which winds up counter-clockwise. Developments in manufacturing and design have led to the introduction of kit form spiral stairs. Steps and handrails can be bolted together to form a complete unit. These stairs can be made out of steel, timber, concrete or a combination of materials. Helical or circular stairs do not have a central pole and there is a handrail on both sides. These have the advantage of a more uniform tread width when compared to the spiral staircase. Such stairs may also be built around an elliptical or oval planform. Both double spiral and double helix staircases are possible, with two independent helical stairs in the same vertical space, allowing one person to ascend and another to descend, without ever meeting if they choose different helices. 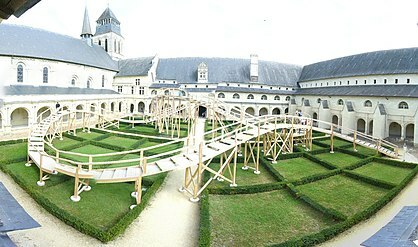 For examples, the Pozzo di S. Patrizio allows one-way traffic so that laden and unladen mules can ascend and descend without obstruction, while Château de Chambord, Château de Blois, and the Crédit Lyonnais headquarters ensure separation for social purposes. Fire escapes, though built with landings and straight runs of stairs, are often functionally double helices, with two separate stairs intertwined and occupying the same floor space. This is often in support of legal requirements to have two separate fire escapes. Both spiral and helical stairs can be characterized by the number of turns that are made. 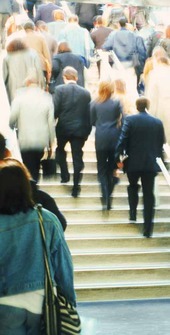 A "quarter-turn" stair deposits the person facing 90 degrees from the starting orientation. Likewise, there are half-turn, three-quarters-turn and full-turn stairs. A continuous spiral may make many turns depending on the height. 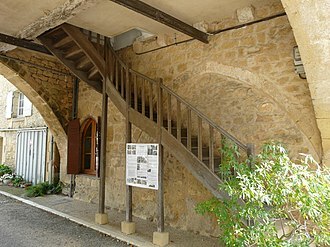 Very tall multi-turn spiral staircases are usually found in old stone towers within fortifications, churches and in lighthouses. 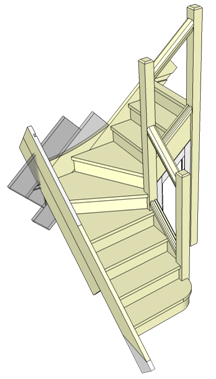 Winders may be used in combination with straight stairs to turn the direction of the stairs. This allows for a large number of permutations. 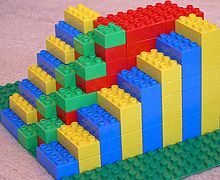 An alternating tread stair (center) between a half-width stair (left) and full-width stair (right), built with Duplo blocks. 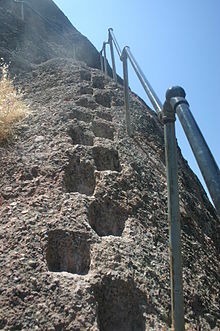 An alternating tread stair climbing the steep slope of a pinnacle in Pinnacles National Park, California, United States. Where there is insufficient space for the full run length of normal stairs, alternating tread stairs may be used. Alternating tread stairs allow for a safe forward-facing descent of very steep stairs. The treads are designed such that they alternate between treads for each foot: one step is wide on the left side; the next step is wide on the right side. There is insufficient space on the narrow portion of the step for the other foot to stand, hence the person must always use the correct foot on the correct step. The slope of alternating tread stairs can be as high as 65 degrees as opposed to standard stairs, which are almost always less than 45 degrees. The advantage of alternating tread stairs is that people can descend face forward. The only other alternative in such short spaces would be a ladder which requires backward-facing descent. Alternating tread stairs may not be safe for small children, the elderly or the physically challenged. Building codes typically classify them as ladders and will only allow them where ladders are allowed, usually basement or attic utility or storage areas not frequently accessed. The image on the right illustrates the space efficiency gained by an alternating tread stair. The alternating tread stair appears in the image's center, with green-colored treads. The alternating stair requires one unit of space per step: the same as the half-width step on its left, and half as much as the full-width stair on its right. Thus, the horizontal distance between steps is in this case reduced by a factor of two, reducing the size of each step. The horizontal distance between steps is reduced by a factor less than two if for construction reasons there are narrow "unused" steps. There is often (here also) glide plane symmetry: the mirror image with respect to the vertical center plane corresponds to a shift by one step. Alternating tread stairs have been in use since at least 1888. On a rarely used staircase from before 1754, the Crown Princess of Sweden ascends from the Stockholm Palace garden with her husband and baby in 2013. Ergonomically and for safety reasons, stairs must have certain measurements so that people can comfortably use them. Building codes typically specify certain measurements so that the stairs are not too steep or narrow. Nicolas-François Blondel in the last volume of his Cours d'architecture (1675–1683) was the first known person to establish the ergonomic relationship of tread and riser dimensions. He specified that 2 x riser + tread = step length. It is estimated that a noticeable mis-step occurs once in 7,398 uses and a minor accident on a flight of stairs occurs once in 63,000 uses. Stairs can be a hazardous obstacle for some, so some people choose to live in residences without stairs so that they are protected from injury. Stairs are not suitable for wheelchairs and other vehicles. A stairlift is a mechanical device for lifting wheelchairs up and down stairs. For sufficiently wide stairs, a rail is mounted to the treads of the stairs, or attached to the wall. A chair is attached to the rail and the person on the chair is lifted as the chair moves along the rail. Staircase between levels at Cabot Circus shopping centre, Bristol, England, United Kingdom. A sitting area is provided on the right of the staircase proper. Construction of steps – Steps should have level treads, they may have open risers but if so treads should overlap at least 16 mm (0.6 in). Domestic private stairs are likely to be used by children under 5 years old so the handrail ballister spacing should be constructed so that a 100 mm (3.9 in) diameter sphere cannot pass through the opening in the risers in order to prevent children from sticking their heads through them and potentially getting stuck. Headroom – A headroom of 2 m (78.7 in) is adequate. Special considerations can be made for loft conversions. Width of flights – No recommendations are given for stair widths. Length of flights – The approved document refers to 16 risers (steps) for stairs in shops or assembly building. There is no requirement for private stairs. In practice there will be fewer than 16 steps as 16 x 220 mm (8.7 in) gives over 3.5 m (137.8 in) total rise which is way above that in a domestic situation. Guarding – Flights and landings must be guarded at the sides where the drop is more than 600 mm (23.6 in). As domestic private stairs are likely to be used by children under 5 the guarding must be constructed so that a 100 mm (3.9 in) diameter sphere cannot pass through any opening or constructed so that children will not be able to climb the guarding. The height for internal private stairs should be at least 900 mm (35.4 in) and be able to withstand a horizontal force of 0.36 kN/m (2.1 lbf/in). Industry guidance on designing a staircase to UK Regulation and Standards. Minimum tread length, typically 9 inches (229 mm) excluding the nosing for private residences. Some building codes also specify a minimum riser height, often 5 inches (127 mm). Riser-Tread formula: Sometimes the stair parameters will be something like riser plus tread equals 17–18 inches (432–457 mm); another formula is 2 times riser + tread equals 24.6 inches (625 mm), the length of a stride. Thus a 7 inches (178 mm) rise and a 10.6 inches (269 mm) tread exactly meets this code. If only a 2 inches (51 mm) rise is used then a 20.6 inches (523 mm) tread is required. This is based on the principle that a low rise is more like walking up a gentle incline and so the natural swing of the leg will be longer. Low rise stairs are very expensive in terms of the space consumed. Such low rise stairs were built into the Winchester Mystery House to accommodate the infirmities of the owner, Sarah Winchester, before the invention of the elevator. These stairways, called "Easy Risers" consist of five flights wrapped into a multi-turn arrangement with a total width equal to more than four times the individual flight width and a depth roughly equal to one flight's run plus this width. The flights have varying numbers of steps. Slope: A value for the rise-to-tread ratio of 17/29 ˜ 0.59 is considered optimal; this corresponds to a pitch angle of about 30°. Variance on riser height and tread depth between steps on the same flight should be very low. Building codes require variances no larger than 0.1875 inches (4.76 mm) between depth of adjacent treads or the height of adjacent risers; within a flight, the tolerance between the largest and smallest riser or between the largest and smallest tread can not exceed 0.375 inches (9.5 mm). The reason is that on a continuous flight of stairs, people get used to a regular step and may trip if there is a step that is different, especially at night. The general rule is that all steps on the same flight must be identical. Hence, stairs are typically custom made to fit the particular floor to floor height and horizontal space available. Special care must be taken on the first and last risers. Stairs must be supported directly by the subfloor. If thick flooring (e.g. thick hardwood planks) are added on top of the subfloor, it will cover part of the first riser, reducing the effective height of the first step. Likewise at the top step, if the top riser simply reaches the subfloor and thick flooring is added, the last rise at the top may be higher than the last riser. The first and last riser heights of the rough stairs are modified to adjust for the addition of the finished floor. Maximum nosing protrusion, typically 1.25 inches (32 mm) to prevent people from tripping on the nosing. Height of the handrail. This is typically between 34 and 38 inches (864 and 965 mm), measured to the nose of the tread. The minimum height of the handrail for landings may be different and is typically 36 inches (914 mm). Handrail diameter. The size has to be comfortable for grasping and is typically between 1.25 and 2.675 inches (31.8 and 67.9 mm). Maximum space between the balusters of the handrail. This is typically 4 inches (102 mm). Openings (if they exist) between the bottom rail and treads are typically no bigger than 6 inches (152 mm). Headroom: At least 83 inches (211 cm). Maximum vertical height between floors or landings. This allows people to rest and limits the height of a fall. Not allow doors to swing over steps; the arc of doors must be completely on the landing/floor. 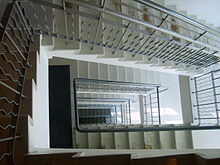 A stairwell may be designated as an area of refuge as well as a fire escape route, due to its fire-resistance rated design and fresh air supply. The American Disabilities Act and other accessibility standards by state (such as TAS) do not allow open risers on accessible or egress stairs. There is no newel at Loretto Chapel's spiral staircase (the "Miracle stair") in Santa Fe, New Mexico, US. A spiral staircase inside Cremona's Torrazzo, Italy. Upward view of the Tulip Stairs & lantern at the Queen's House, Greenwich, United Kingdom. Spiral stairway seen from below; Melk Abbey, Austria. The wooden spiral stairs of the Tour de Sauvabelin in Lausanne. As much as stairs are very functional, stairs are can be very decorative and an impressive part of a building. Especially at the entrance of a large building stairs play an important role in the first impression of a building. In large buildings such as banks this is very popular. 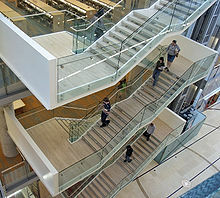 Modern companies and construction utilize the opportunities of functional stairs to actually upgrade buildings. Large utilities such as banks as well as residential buildings such as penthouses (e.g. in St George Wharf Tower) have modern and luxurious installations. A wide shot of the massacre on the "Odessa Steps" from The Battleship Potemkin (1925). 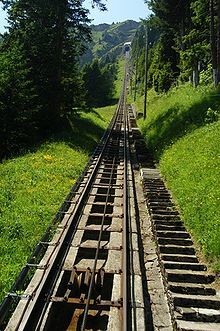 The longest stairway is listed by Guinness Book of Records as the service stairway for the Niesenbahn funicular railway near Spiez, Switzerland, with 11,674 steps and a height of 1,669 m (5,476 ft). The stairs are usually employee-only, but there is a public run called "Niesenlauf" once a year. Mount Girnar, one of the holiest of sacred places for Hindu, Jain, and Buddhist followers, and also for some Muslims is located in Junagadh district in the Indian state of Gujarat in Saurashtrian peninsula. At a height of 1100 metres, with five summits, each adorned with several sacred places are accessed on foot by soaring close to 10,000 steps along a rugged terrain and deciduous forest that is also the last home for Asiatic lions. 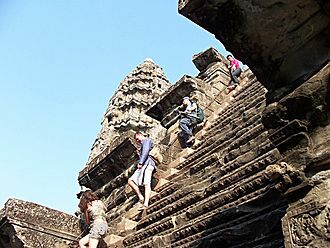 It is the longest completely stone-made stairway in the world. A flight of 7,200 steps (including inner temple Steps), with 6,293 Official Mountain Walkway Steps, leads up the East Peak of Mount Tai in China. The Haʻiku Stairs, on the island of Oʻahu, Hawaiʻi, are approximately 4,000 steps which climb nearly 1⁄2 mile (0.8 km). Originally used to access longwire radio radio antennas which were strung high above the Haʻiku Valley, between Honolulu and Kaneʻohe, they are closed to hikers. The Flørli stairs, in Lysefjorden, Norway, have 4,444 wooden steps which climb from sea level to 740 metres (2,428 feet). It is a maintenance stairway for the water pipeline to the old Flørli hydro plant. The hydro plant is now closed down, and the stairs are open to the public. The stairway is claimed to be the longest wooden stairway in the world. The longest stone stairs in Japan are the 3,333-steps stairs of the Shakain temple in Yatsushiro, Kumamoto. 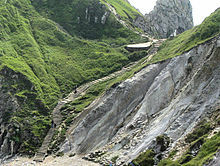 The second ones, Mount Haguro stone stairs, have 2,446 steps in Tsuruoka, Yamagata. The CN Tower's staircase reaches the main deck level after 1,776 steps and the Sky Pod above after 2,579 steps; it is the tallest metal staircase on Earth. The Penrose stairs, devised by Lionel and Roger Penrose, are a famous impossible object. The image distorts perspective in such a manner that the stairs appear to be never-ending, a physical impossibility. The image was adopted by M. C. Escher in his iconic lithograph Ascending and Descending. The World Trade Center Survivors' Staircase is the last visible structure above ground level at the World Trade Center site. It was originally two outdoor flights of granite-clad stairs and an escalator that connected Vesey Street to the World Trade Center's Austin J. Tobin Plaza. 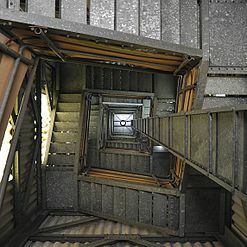 During the September 11, 2001, attacks, the stairs served as an escape route for hundreds of evacuees from 5 World Trade Center, a 9-floor building adjacent to the 110-story towers. Stairwell A was the lone stairway left intact after the second plane hit the South Tower of the World Trade Center during the September 11 attacks. It was believed to have remained intact until the South Tower collapsed at 9:59 am. 14 people were able to escape the floors located at the impact zone (including one man who saw the plane coming at him), and 4 people from the floors above the impact zone. Numerous 911 operators who received calls from individuals inside the South Tower were not well informed of the situation as it rapidly unfolded in the South Tower. Many operators told callers not to descend the tower on their own, even though it is now believed that Stairwell A was most likely passable at and above the point of impact. In London, England a notable staircase is that to The Monument to the Great Fire of London, more commonly known simply as "the Monument". This is a column in the City of London, near the northern end of London Bridge, which commemorates the Great Fire of London. The top of the Monument is reached by a narrow winding staircase of 311 steps. Constructed between 1671 and 1677, it is the tallest isolated stone column in the world. The Spanish Steps in Rome are a monument of late Italian Baroque architecture connecting the Piazza di Spagna with the Trinità dei Monti up the side of the Pincian Hill. Designed by Francesco De Sanctis and constructed 1723–1725, the 135 steps form a wide vista looking down toward the Tiber. The steps are adorned with garden terraces blooming with azaleas and have been widely celebrated in cultural work. The Loretto Chapel in Santa Fe, New Mexico is well known for its helix-shaped spiral staircase, which has been nicknamed "Miraculous Stair". It has been the subject of legend and rumor, and the circumstances surrounding its construction and its builder are considered miraculous by the Sisters of Loretto and many visitors. 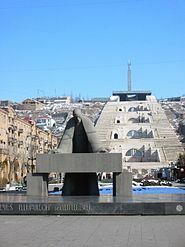 Yerevan Cascade steps (572 steps) in Yerevan, Armenia. 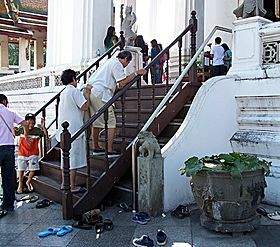 Modified stairway for the elderly in Thailand. 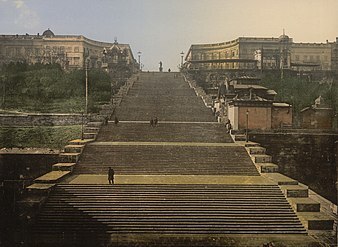 The Potemkin Stairs (1834–41) in Odessa, Ukraine. 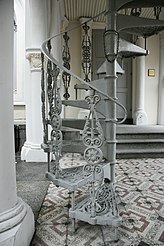 Spiral stairs with ornamental balusters. 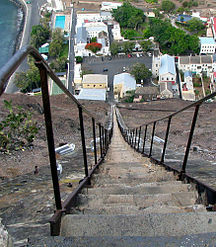 The Jacob's Ladder, between Jamestown and Half Tree Hollow, in Saint Helena. 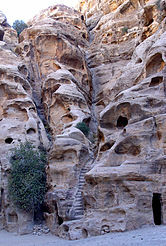 Stairs of rock placed in a natural passage. Outdoor stairway on the Alameda Ridge in Portland, Oregon, United States. 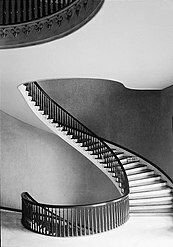 Pioneer spiral staircase, Deaf Smith County Historical Museum, Hereford, Texas. 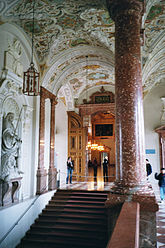 Emperor's Stairs in the Residenz of Munich, Bavaria, Germany. The 19th century theatre of Weißenhorn, Germany. Endless stairway at KPMG, Munich, Germany. Wooden spiral stairs in the tower of Salisbury Cathedral. 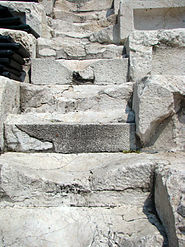 Foot-worn staircase of the Plovdiv Roman amphitheatre showing multiple repairs. 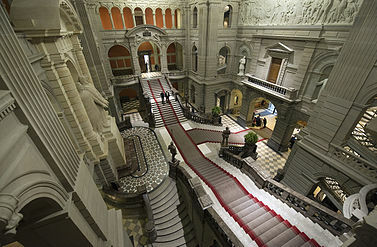 Multiple stairs inside the Federal Palace of Switzerland. Spiral stairway in the Alabama State Capitol. 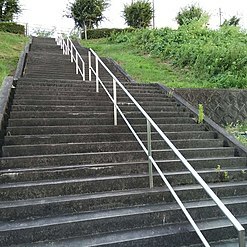 Stairs in Ikoma[disambiguation needed], Japan. An early kind of burglar alarm - trip stairs. The idea was that when a robber broke in, he would try to sneak quietly up the stairs in the dark, not knowing that on the way up there would be steps close together (like the second and third from the top), causing him to hopefully trip and wake someone up. ^ "Stair Nosing". www.amstep.com. Retrieved 2018-01-26. ^ "Stair Part Terminology 2 - Useful Words To Know". Blueprint Joinery. Retrieved 2018-11-02. ^ "Banister". Merriam Webster dictionary. Retrieved 2 November 2010. ^ Hsu, Tiffany. "Floating staircases make their work look light and easy". latimes.com. Retrieved 2018-01-26. ^ Terminology. Stairplace.co.uk. Retrieved on 2013-11-11. ^ a b c d Neufert, Ernst; Neufert, Peter (2000). Architects' Data (3rd ed.). Blackwell Science. p. 191. ISBN 0-632-05771-8. ^ "Types of stairs - Advantages & Disadvantages". Keuka Studios. Retrieved 2018-01-26. ^ "Info" (PDF). www.legislation.gov.uk. 2010. ^ "Spiral Staircase Building Code | Salter Spiral Stair". Salter Stairs. Retrieved 2018-01-26. ^ "There's a Very Specific Reason Medieval Castles Stairs Were All Clockwise - Nerdist". nerdist.com. 28 November 2016. 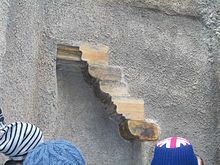 ^ "r/AskHistorians - Were castle stairs designed to impede sword use?". reddit. ^ Truthorial. "A Castle's Spiral Staircase Was a Defensive Measure". truthorial.com. ^ James H. Monckton (1891). Moncktons One Plane Method Of Hand Railing and Stair Building, Copyright 1888. John Wiley & Sons. p. Plate 2, Figure 4. ^ "Vol. 4&5 (see pages 692&693)". Retrieved 14 August 2012. ^ Bartlett, James (1911). "Staircase" . In Chisholm, Hugh. Encyclopædia Britannica. 25 (11th ed.). Cambridge University Press. p. 763. ^ "Stair Safety: A Review of the Literature and Data Concerning Stair Geometry and Other Characteristics". Archived from the original on 23 September 2006. Retrieved 2 November 2010. ^ Haggerty, Maryann (2010-08-14). "Stairs can pose a problem as you get older, so take steps now to ease the climb". ISSN 0190-8286. Retrieved 2018-01-26. ^ "A-Mezz Engineered IBC Stairs". Retrieved 2 November 2010. ^ Codes. Amezz.com. Retrieved on 2013-11-11. 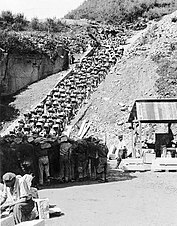 ^ Stairway Manufacturers' Association. Stairways.org. Retrieved on 2013-11-11. ^ Section 3231(c) of the State of California Building Code specifies a rise between 4 and 7.5 inches (100 and 190 mm) and a minimum run of 10 inches (250 mm). ^ "Popular Mechanics homepage". Archived from the original on 22 April 2009. Retrieved 2 November 2010. ^ "ADA 2010". ADA Compliance. ^ "Welcome to Lysefjord". Archived from the original on 7 May 2007. Retrieved 2 November 2010. ^ National Commission on Terrorist Attacks (July 22, 2004). The 9/11 Commission Report (PDF) (first ed.). W. W. Norton & Company. p. 294. ISBN 0-393-32671-3. ^ "Monument". www.cityoflondon.gov.uk. City of London. 28 April 2009. Archived from the original on 20 June 2009. Retrieved 28 April 2009. ^ The Cascade Complex. Cmf.am. Retrieved on 2013-11-11.